Born in Magdeburg in 1681, Georg Philipp Telemann rejected a vocation in law, insisting that music was to be his focus. An organiser of concerts and a publisher of musical scores, he was a highly versatile entrepreneur as well as a throughouly 'modern' musician, one who remained at the forefront of musical innovation throughout his career. Today he is widely regarded as Germany's leading composer during the first half of the 18th century. This release is centered around four cantatas taken from the composer's Harmonischer Gottesdienst ('Music for Religious Services'), a collection of cantatas for solo voice, flute, oboe or violin, and harpsichord that, on account of its idiomatic writing for voice, its relation to the instrumental parts and the many indications concerning interpretation, rests among the great achievements of the period. One of Telemann's characteristic skills was his ability to imbue the arias with the sort of brilliance that we normally associate with solo concertos (consider the radiance of the initial aria in Deine Toten werden leben), and this extends to his often virtuosic use of the recorder in the works -- an instrument with which he was obviously familiar. Indeed, that Telemann was a more than competent player himself can be seen from the quality and quantity of music that he wrote for the recorder, and it is two of his lesser-known creations for the instrument -- the E minor Partita and the Trio Sonata in G minor -- which form the remainder of this highly engaging disc. 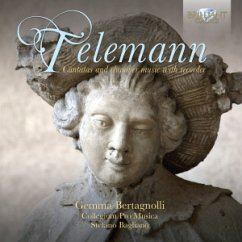 Gemma Bertagnolli and Stefano Bagliano -- both leading experts in the field of period Baroque performance -- are the soprano and recorder soloists on this release, and are aptly supported by the historical group Collegium Pro Musica. The disc is a welcome addition to the rich assortment of Telemann recordings in Brilliant Classics' ever-growing catalogue. Other information: - Gemma Bertagnolli is widely considered to be one of the leading sopranos in Early Music. She is a favoured soloist of such celebrities as Rene Jacobs, Rinaldo Alessandrini, Fabio Biondi, Diego Fasolis, Trevor Pinnock, Ton Koopman, Ottavio Dantone and many others. Her voice is powerful, lyrical and passionate, always conveying the emotional message of the text. - On this new recording (2012) Gemma joins the Early Music group of Stefano Bagliano, also a specialist in the field, in Cantatas for solo soprano, recorder and continuo, drawn from Die Harmonische Gottesdienst, brilliant works displaying vocal and instrumental virtuosity of a high level. - Contains comprehensive booklet notes, sung texts and artist/ensemble biographies.